Low Price & Fast Service. Call Now! If you need your sunroof repaired or completely replaced, Sunroof King is the best place to call. 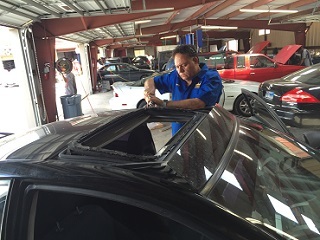 We offer quick turnarounds on all of our sunroof repair services. Read more about our services here.. Call now to schedule a service for your vehicle. We offer many appointment times to fit your schedule and even offer a complimentary shuttle back to your workplace..
Is your sunroof or moonroof cracked or damaged in any way? Do you worry about your sunroof collapsing while you drive around town? Stop the worrying and seek professional help from Sunroof King. We are a locally owned and operated sunroof repair company based in Houston. We specialize in sunroof installation, repair, and replacement services. We have the tools, training, and natural skills needed to perform flawless workmanship. We are confident our services will fit your needs and your budget. Contact us today to find out the next available appointment time for your car. Because we offer specialized services, our sunroof repairs are completed quickly without sacrificing quality. Enjoy a new and safer sunroof soon with our help. Our clients are very important to us. We are committed to offering quality services and beautiful results. We offer an unconditional warranty on all our sunroof repair work for your satisfaction. We will do the job right the first time, which means you will drive away from our shop pleased with our work. We believe our business is unique because we offer unmatched quality and friendly service at an unbeatable price. Call us now to get a quote on any of our services. We look forward to serving you at Sunroof King!